Along with my deliciously orange Swingline stapler, there are some other useful orange items in my house. 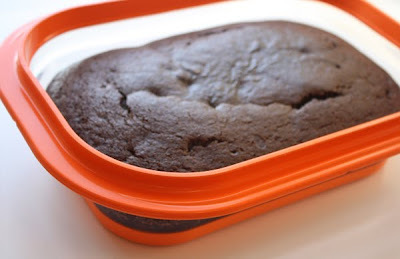 Have you heard of collapsible bakeware made by FoldTuk? It's pretty neat: you can bake in it, microwave it, put a lid on it, freeze it, dishwash it, and flatten it for storage. I just got this container, and it's surprisingly heavy and sturdy. My little chocolate cake baked up just fine and didn't seem to stick to the pan. The only drawback is that I'm a moron; one minute after I took the cake out of the oven, I decided to move it to the other counter. Since the stuff looks like tupperware and I have a very short memory, I automatically grabbed it without a potholder. I didn't get any burn marks. But I wouldn't recommend testing new bakeware this way. Of course I'm fond of Fiskars scissors, too. Not just because the brand is orange, but because the quality is great. I'll tell you a secret. 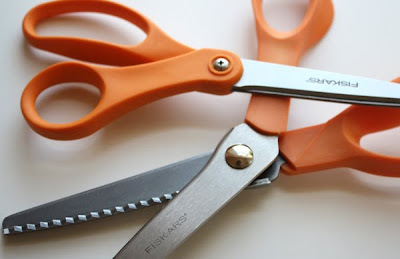 Someone at Fiskars noticed the sad, generic black scissors appearing in many of my posts. How is this possible coming from someone who claims to like orange, they wondered! I was mortified by my own hypocrisy. So they took pity and sent me a regular scissors for paper and a pinking shears. Awesome. Now I don't have to borrow my friend's pinker anymore. Good news for you, Megan. 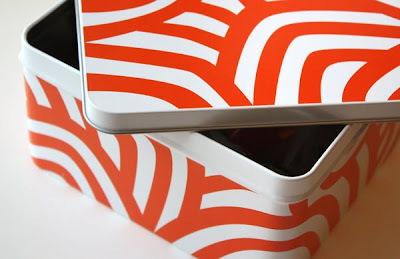 I also adore a set of storage tins I got from Ikea awhile back. This one holds my tape and paper punches. I love cool design that's so affordable I can buy it with spare change from my car. Looks like they don't sell this set anymore, but this new one has orange, too. I like that little cake pan! How big is it? It's the 6-cup one on this page. It's about 11" x 7". i love orange things! i love the pan and that gift tin! Ha! You SO needed new scissors! Glad to see they're being put to good use ;) We love your blog! Getting a message – and a gift – from the Fiskateers: priceless! Congrats. I leave the idea of this bakeware - I just wonder about the material it's made out of. Can it really be healthy and safe? I did the exact same thing shortly after pulling my Mom's collapsible ovenware out of a 400 degree oven. As my little brother said, I learned that hot plastic looks like cold plastic. It always makes my day to find new fun, but practical, orange things. It's look so neat like this, I mean the kitchen ware in orange, all in one colour. Does FoldTuk Bakeware & Roaster use any Petroleum base plastic in its products? Due to published study reports from known scientific groups citing potential risks from Petroleum base plastics, FoldTuk has committed to use only the safest materials that will protect its customers and families from any long-term health risks. Is FoldTuk products PTFE / PFOA free? What is PTFE / PFOA? ANSWER: PTFE and PFOA are commonly used chemicals to create a non-stick coating cookware and bakeware. FoldTuk products are naturally non-stick and are PTFE / PFOA chemical free. Paula, 360 years? REALLY?!? Wow. And of course I wholeheartedly approve of your MacBook case. I'm an orange fiend too. I love when fall rolls around, because I have an excuse to buy gobs of orange pumpkins and display them all over the house. I've decided that the Cinderella variety pumpkins have the most supremely perfect shade of orange. Fiskars scalloped scissors are great, too! Will even scallop fabric beautifully. I wish fiskars sent me stuff. :-) orange you lucky? we love our ikea tins... and the fabric scissors from fiskars are worth adding to your collection - the scissor-sharpening tool worrks brilliantly (helpful if you are a muppet like me and occasionally snip pins. mmm. Ikea has some great orange items. We got a little soft throw rug in bright orange for the living room, and it's the go-to snuggle accoutrement. Fiskers also makes great axes. The handles are hollow so it you are a graphic designer with carpal tunnel, the vibration of the axe contacting the wood is KILLER on the nerves in the wrists, elbows and shoulders. The hollowness of the handle takes all the energy out through the handle instead of up it unlike most other handle types. i have learned the lesson about glass--hot glass looks like cold glass--i have learned this more than one time...short attention spans unite! Love this post, just because something's practical doesn't mean it can't be fun! I've been using the Fiskar pinking shears for decades, and they're still by far the best ones made. Obviously they stay sharp :-), but they're the right combination of lightness and strength. Thanks for that list, it looks like I desperately need some baking stuff :-). Saw this at The Scoop and thought it was worth mentioning if you haven't seen it! I love your blog. I like orange too much!!! I just got a Foldtuk for Xmas, but haven't used it yet. orange always make me fresh!